Fresh Pack Onions - Boardman Foods Inc. 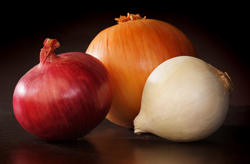 Premium fresh onions are packed to suit your specific quality, size and packaging needs. This includes all colors, package sizes, flavors, varieties and ring specifications. With the use of our state of the art storage facility we are able to supply you a quality fresh northwest onion year round. Yellow and red organic onions are also available. Certified by Oregon Tilth.